Socks are interesting. You hated receiving them for a Christmas gift as a child, but since you’ve gotten older, they’re all you ask for. Maybe that isn’t true for everyone but it certainly has been my experience. But socks are not one size fits all, not in size or activity. We need different socks for different purposes. In this article, we’re going to focus on the best winter hiking socks to keep your feet healthy and happy. Socks are even more important than usual when we participate in strenuous activities or activities we aren’t used to. Winter hiking and other winter activities fall under this category. So let’s get you all the information you need to get your feet properly outfitted. You may have thought this was a no-brainer but there are a number of things you might be doing wrong that can really affect the health and comfort of your feet. And if you do any kind of hiking, walking or standing (which hopefully includes all of us) you know that when your feet ain’t happy, ain’t nobody happy. One of the most obvious things to do, yet surprisingly often overlooked, is to keep your sock out of the dirt, or the snow, or whatever other media you are traversing. When you go to put on your boots don’t set your unbooted, socked foot on the ground! On multi-day trips, change into a clean pair of socks before going to bed. This is especially important in the winter time! Make sure the socks are dry because sleeping in wet socks can lower your body temperature and soften the skin on your feet making it more susceptible to hot spots and blisters. And finally, remember that you have the option of wearing multiple pairs of socks at a time if it suits your needs. Many people wear a thin sock liner which significantly helps protect against blisters. Which socks should I wear? Not all socks are created equal. I made the mistake of wearing an unsuited pair of socks for a quick little winter jaunt and ended up without skin on the outer side of each ankle. A painful mistake. The quality of the material is important if you want to avoid this, and also plays a big role in keeping your feet warm during winter hiking. 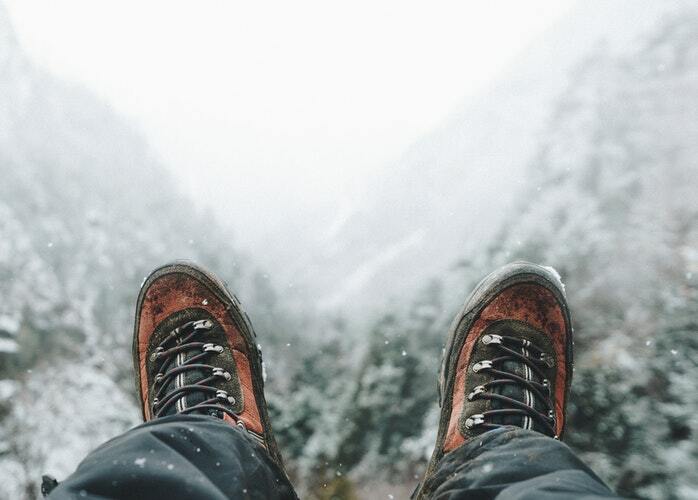 Let’s take a look at three of the best sock brands for winter hiking. Keep in mind that your choice may also be influenced by the conditions of your environment. Are you hiking in the snow? Will it be very wet? Are you camping overnight? Do your feet sweat a lot? Do your feet have trouble staying warm? Ask yourself these questions as you go through the list and evaluate how well they can fulfill your needs. Darn Tough has a glowing reputation among hikers of all kinds. Whether you’re a thru-hiker or a weekend warrior these socks are built to last, built comfortable and built for you. Darn Tough has a number of options within their hiking sock category. The Sock you choose will be dependent on your preferences. You can choose from light to full cushioning depending on how much warmth you need, if your feet get very warm while hiking, like mine, you may want less cushioning and vice versa. You can also select from no-show socks to over the calf-length. I generally recommend staying away from shorter-length socks for winter hiking because you want the sock to protect any skin that may come in contact with your boot, and generally, you will be wearing a taller boot instead of a hiking shoe, or trail runner in the winter time. You can choose either high-quality merino wool socks or a unique synthetic blend called Coolmax, made from polyester, nylon, and spandex. The Coolmax socks may be ideal for hikers who sweat a lot as it is engineered specifically to draw moisture away from the skin. Another benefit of the Coolmax is that it can stay cooler in summer while still keeping you warm in the winter. I love these socks because they have a high thread count and are designed not to slip or bunch. They feel great and every sock you purchase from Darn Tough is guaranteed for life! If you need any more convincing just check out the review section on darntough.com! Every sock is a five-star sock! Smart Wool is right up there with Darn Tough. They are almost always said practically in the same breath when experienced hikers give recommendations to newbies. One of the best things about The Smart Wool Website is that it has a sock finder that will allow you to put in all your preferences and let it locate the perfect socks for you. The sock finder walks you through all your options and explains why you might want a certain choice over another. All Smart Wool socks are made from Merino wool, a premium type of wool that is thinner and softer than the regular kind. It has natural odor reducing qualities, as well as natural wicking ability. It’s also fire-resistant and biodegradable! As far as cushioning and length go, Smart Wool offers all the same options as the Darn Tough socks. Smart Wool also goes a step further and allow you to choose a sock with additional support in key pressure areas. This may be a great pick for someone who likes more padding and comfort than they can get from their boot. Again, the best winter sock for you will depend on your preferences and environmental conditions. You can also find Smart Wool socks on Amazon and take advantage of free shipping options if you’re a prime member. If you’re on a budget, Kirkland (the Costco brand name) socks are for you. At Costco, you can get six pairs for less than the price of one pair from Darn Tough or Smart Wool. And, pro-tip, you can purchase items from Costco.com even if you don’t have a Costco membership. Just expect to pay a very small non-member surcharge. Or you can just bum your buddy’s membership information to save the extra dollar. Kirkland has trail socks for both men and women. However, this is where the customization options end. They have one option, take it or leave it. However, they are made with a merino wool blend with a full cushion and added heel and toe support. The Kirkland socks are made in China, unlike Darn Tough and Smart Wool which are made in the USA and come with no guarantee. However, they are great socks! And for the price, it’s almost silly not to try them out. It’s no question that a lot of hikers love them! I wouldn’t necessarily recommend waterproof socks unless you are in dire need of them. Most often a well-waterproofed boot, maybe some gaiters, will do the trick to keep your feet dry enough. However, if you want the extra protection Sealskinz is the way to go. You need to be careful with waterproof socks as cheaper brands will likely do more harm than good. They will keep the moisture out, yes, but they will often trap your sweat in. This is can be murder on your feet. Sealskinz socks are somehow breathable and waterproof. If you’re a swamp-hiker, your feet don’t sweat too much, and you’re willing to pay top dollar for a sock then Sealskinz could be what you’re looking for. It has a waterproof membrane and is lined with merino wool to keep your feet warm and comfy on your wet winter hiking trip. You can often find great discounts on either Amazon or Backcountry where you will usually pay several dollars less than if you purchase directly from the Sealskinz website. Hope these brands will knock your socks off! Figuratively of course. Let’s literally hope that they will stay on and keep you warm, dry and loving your winter adventures! If you have any questions feel free to leave a comment below or contact me directly and I will do my best to help you out. And lastly, if you have tried any of these brands, or if there is a brand not on the list that you would like to sing praises to, please let us know below! I never knew how important it is to select the right socks for the right activity. I love snowboarding a lot in the winter and have often experienced the troubles of selecting the right socks. It’s nice to know that I can read your article and know which sock I want for the best experience. Thank you for taking your time to share this with an outdoors enthusiast like me. Socks really can make a world of a difference. You can find ski socks from both darn tough and smart wool and don’t be fooled by the name, ski socks are perfect for snowboarding as well. I honestly have an obsession with socks! I love to wear socks! These look great and comfortable but I love that there are a variety of color options, which is not hard to get but to get it with comfort is a plus. I do struggle to find something that will keep my feet warm because even though it has a great color and style, the design is not great and my feet do get cold. Great piece on the best socks. Hi Nicolette! Since your feet get cold easily, definitely get some socks with a higher level of cushion. This will increase the warmth for you. This is great advice for hikers and weekend walkers. I’ve seen many articles about what boots you should wear but it’s great to actually find a website with a post about the socks to go with those boots as many people especially weekend walkers would not know about the technical aspect of a good sock. I personally like the idea of a liner sock followed by the darn tough sock. I don’t mind the smcistci socks either to go with my boots for shorter walks. Thanks for reaching out Darren. I am unfamiliar with the sock brand that you mention, but I too am usually fine with less technical socks for shorter walks. I think that I’m now going to have to move onto the Darn Tough brand of socks for hiking, as the cheaper brand I have been using over the last couple of years wear through consistently. I have one of those big toes that point upwards, always breaking through poorly made socks! One question though – what are their water resistance like? Do they manage to keep the feet dry or do they hold small amounts of water when wet? To Confirm, you are asking about the water resistance of the Darn Tough socks? The coolmax material is designed to be quick drying. And Merino wool dries pretty quickly as well. It can absorb a high amount of moisture and it still keeps its insulating properties. But they are by no means waterproof. If you get them wet, they’ll be wet. The only waterproof socks on the list are the Sealskinz. But you more than likely don’t need waterproof socks. Waterproof your boots and you will be fine. Darn tough will be perfect for you because they have a lifetime guarantee! I’m right there with you. I love crazy colors and fun looking socks. In actuality, both Smart Wool and Darn Tough have socks in a variety of different colors! Obviously I couldn’t include pictures of all of them in my review. But the links I have included will take you over to websites where you can see the full inventory. As a hunter and a hiker and an all-around comfortable sock lover, I know the importance of a great sock! Many a time I have set out into the woods underprepared in my footwear and regretted it. However, when I’ve had the right sock, it’s made all the difference in the world. Thanks so much for this informative article and I will definitely be checking some of these out before next hunting season! God bless and Merry Christmas! Thanks for sharing you experience Steve! Merry Christmas to you as well! Hi Mariah, I’ve never been hiking in my whole life. Even though there were places near me that I could have gone, I never had time because of lessons. But one day I hope I can do this. My question is: How hard are these socks compared to normal socks? And how are these socks different from other socks? I hope you will go hiking soon. These socks are not hard, they are soft and comfortable. They are different from the type of socks you would wear every day because they are specially made to provide comfort when you need it, protect your feet, wick away moisture so you stay dry, and stay in place so you don’t get blisters. They are high-performance socks. And when you do go hiking I hope you will try out a pair! As a hiker I have found your article very detailed. Like you stated a lot of folks do not realize just how important good socks are for hiking. Nothing worse than a sock that gets bunched up or slips around inside your hiking shoes. You mentioned two of my favorites Darn Tough and Kirkland. Between the two I will say Darn Tough is my all time favorite mainly for the durability. Although for the price Kirkland is pretty awesome too , however I have found they do not last nearly long enough but for the price definitely can’t go wrong there. I am happy to have come across this article, I always avoid hiking in winter for the fear of hurting my legs. I am a frequent hiker, I know what it feels like walking with the wrong attire especially for your feet. You get bruises that can last for weeks and you walk with a limp for long. Never heard of waterproof socks before, but I guess if you have waterproof shoes there is no need of waterproof socks. I hope the brands you have highlighted are unisex as you can’t tell from the colors. Such article gives me courage to shop for the right attire and even prepare to actually take up hiking in winter, hopefully next year. Keep the good tips coming, I will check out more of your articles as a gear up for a winter hike. There are both Men’s and Women’s versions of all of these socks. Click the links and you will be able to explore further and find the perfect socks for yourself! My husband needs quality socks to wear to work. He works in a polyethylene plant where they have to do a lot of walking and work in every type of weather, and he has to wear steel-toed work boots. His feet sweat a lot and he goes through a lot of socks, so I’m replacing them all the time. Which ones do you recommend for him? I think some Darn Tough Coolmax socks might be great for him because they wick away moisture. Merino wool also naturally wicks moisture as well if you want to go with a natural fiber instead of synthetic. I have a difficult time finding socks for hiking or anything to do in the winter because I cannot wear wool socks and I think thanks to your review here that I am so glad I came across has given me a great option. The Coolmax are not made with wool how great is this!! And the fact that I can wear them even in the summer is great because I love quad riding. With the brush and low hanging bushes I wear boots so these will be good for then too. My problem is now solved. Definitely try them out Susan! I hope they work great for you.